The first two Whinchats of the autumn on the escarpment this morning. 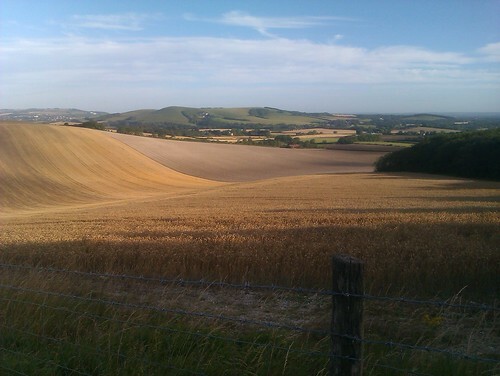 They were along a line of uncut wheat, adjacent to the access land just east of Firle Bostal. Also a single juvenile Stonechat nearby. Presumably a product of the adult pair present in the same spot late last winter. Also noted: lots of Willow Warblers, everywhere, two adult Buzzards and a young one calling from woodland, five Red-legged Partridges. Yesterday morning, just before 5am, a trip outside the front door to chuck water over a cat resulted in my first Common Sandpiper for Firle – the peep-peep-peep so often heard along the Ouse cutting through the still air. This entry was posted in Local sightings and tagged common sandpiper, stonechat, whinchat by Charlie Peverett. Bookmark the permalink. Your ill-treatment of the local moggies has been noted and may be used against you. I was pleased to see a Whinchat this week too. Glad to hear Rampion’s still out, as I hope to be down Sussex way soon. Intended ill-treatment. Little git scarpered. Found lots more Rampion today. They’re common as muck round here Steve!